It is 1940 in England, and tension is high. Blackouts and gas masks are part of daily life. However, even as war encroaches throughout Europe from Germany, crime and corruption are still a threat to society. There are still cases to be investigated and solved. 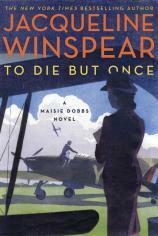 With World War II as the backdrop, TO DIE BUT ONCE is the 14th book in Jacqueline Winspear’s Maisie Dobbs series. In this latest installment, a local youth has gone missing. Local pub owner Phil Coombes asks Maisie to look into the disappearance of his son. Joe, just 15 years old, has been working as an apprentice to Yates and Sons, a local paint and decorating company. His job takes him out of London on a special war assignment to paint buildings on airfields. He must be secretive about his work, but his parents are accustomed to hearing from him regularly. It has been some time now since they last talked to him. Phil mentions to Maisie that as of late, Joe’s demeanor has changed from cheerful to quiet and sullen. He also has complained of headaches. What could have happened to him? "Maisie Dobbs is always looking for truth and the underlying motives in her cases. Her stories are ones that this reviewer always wants to read because of her character, values and thoughts on life." Maisie takes the case with the help of her able assistants, Billy and Sandra. When a young man is found dead in a local village, Maisie is asked to come and view the body. Sadly, it is Joe. His head had been bashed in, in what looks like a fall from some height that landed him in a railroad line yard. The first surmise is that the fall killed him. Did he jump? Was he pushed? Was it an accident? The autopsy is inconclusive, but the pathologist finds toxic matter in his brain. Maisie continues her inquiry, interviewing Joe’s friends and coworkers about his life before his untimely death. She uncovers a link to possible connections to an infamous crime lord who is known for being ruthless in his dealings. When the puzzle pieces of the case finally come together to solve Joe’s death, the Coombes family is devastated. While in the midst of her investigation, Maisie’s professional and personal lives unexpectedly come to cross purposes. On Maisie’s home front, adoption plans are moving forward for the young evacuee for whom she has been caring. And then her longtime friend, Priscilla, has her own crisis in the making when her son, Tim, takes off with a friend in a boat to help rescue the British Expeditionary Forces in Dunkirk. This emotional scenario brings back the losses and tragedies of World War I that both women faced. TO DIE BUT ONCE highlights the direct and indirect costs of war. Maisie Dobbs is always looking for truth and the underlying motives in her cases. Her stories are ones that this reviewer always wants to read because of her character, values and thoughts on life. And, because Jacqueline Winspear’s late father was also a young apprentice in 1940, she is able to draw on that experience to write a story about WWII and England that is close to the heart.